The sandstone monument was erected in 1941 to commemorate the discoverers of Port Phillip Bay and the Maribyrnong and Yarra Rivers. 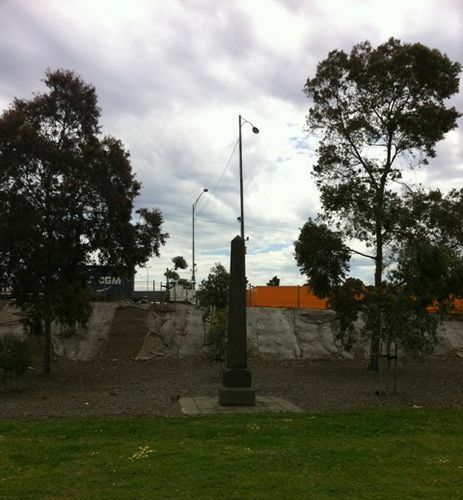 To the singing of "Rule, Britannia," by the public, Mr. A. D. Mackenzie, chairman, Harbour Trust Commissioners, unveiled yesterday afternoon a memorial to the discoverers of Port Phillip Bay and of the Yarra and Maribyrnong rivers, erected just off the new Footscray road, near the swingbridge over the Maribyrnong. Mr Mackenzie said one of the first works carried out in Port Phillip was a wharf built by Capt. George Ward Cole. Mr Isaac Selby, secretary Old Pioneers' Memorial Fund, had wanted a site near the confluence of the Maribyrnong and Yarra rivers for the memorial, but port authorities had to visualise what the port was going to be 100 years hence. Eventually a new dock would be placed in that position, so the trust had found the present site for the memorial, where it was hoped it would be able to remain for ever. Mr. Selby said the memorial was due to the generosity of Mr Allan Tye. Mr. Selby suggested that Mr. Mackenzie might make available an area of land round the memorial which might appropriately be named Rebecca Park, after Batman's little vessel. The inscription on the memorial recites that Port Phillip was discovered by John Murray in the Lady Nelson in February, 1802: that the monument has been erected to mark the original junctionof the Yarra and Maribyrnong rivers, and that the rivers were originally discovered by Charles Edward Grimes in February, 1803, and refound by John Batman in June, 1835. Other early historical facts are also recorded. Mr. Augustus Wolskel, president Victorian Historical Society, Mr. John Gent, and Miss Helen Baillie, vice-president Australian Aborigines' League, were among the other speakers. Argus (Melbourne), 24 November 1941. Which Was Near This Spot. In The Lady Nelson In February 1802. The "Cumberland" With Grimes The Surveyor. The First Man O`War Was The "Calcutta"
At The End Of The Same Year 1803.